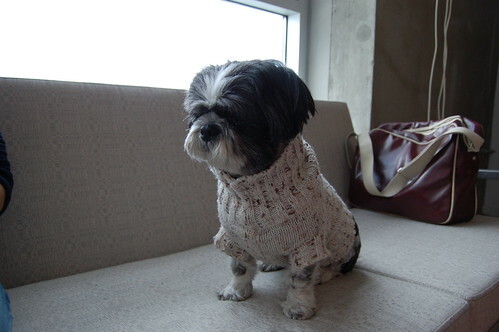 Forgot to bring Nori’s parka this morning so he’s all grumps here, but, looking suave, JCrew style in his favorite sweater. It’s usually nice, nice, nice in LA…but, 4 days of rain and now it’s freezing cold. I understand, this is LA cold… but, it’s still pretty chilling. Here’s the weirdness of LA… rain today, sun tomorrow, rain again on Wednesday, and then sun again. Make up your mind planet! He didn’t have a good weekend, stayed inside since he pretty much hates getting wet. But, there was a break on Sunday and we took advantage of it at the Silverlake Dog Park. A lot of people had the same thing in mind, the small dog park was packed.